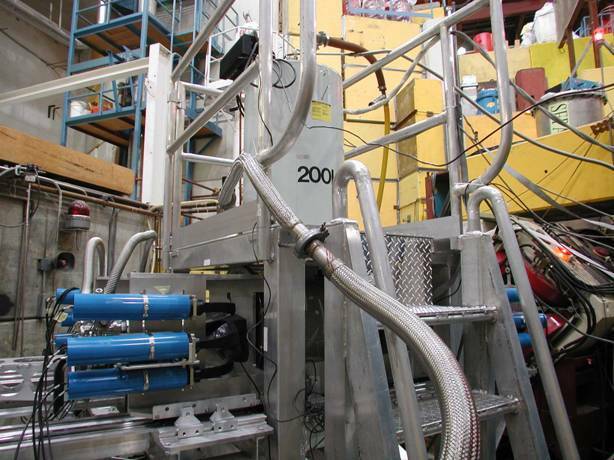 Helios is the workhorse superconducting magnet with a 6-inch diameter, 24-inch long warm bore. It provides 961 G/A, so about 6 T at its maximum current of 60 A. The main counter array is for solid state work in narrow cryostats, and there is another set of counters for larger samples such as gas cells. Both sets have long light guides and modest timing resolution (1ns). Of course all access is axial, but the large bore makes this a versatile magnet. There is no persistence switch so the magnet must be driven constantly. That is actually an asset, because the field tends to be changed frequently in µSR experiments, and a switch heater would boil away a lot of helium.